So what is methotrexate anyway? Methotrexate (also called MTX for short) is a medication prescribed for rheumatoid arthritis (RA). Methotrexate is a disease-modifying antirheumatic drug (DMARD), which means it slows the progression of RA. It’s the most commonly prescribed DMARD for RA, perhaps because it’s recommended by leading medical associations (such as the American College of Rheumatology and the European League Against Rheumatism) as a first treatment. Methotrexate can be used at any stage of the disease, on its own in the early stages or in combination with other medications. Methotrexate is also used to treat psoriasis, psoriatic arthritis, juvenile arthritis, lupus, and some forms of cancer (at much higher doses than for RA). No one knows exactly how methotrexate works, but it interferes with processes in the body that cause inflammation and joint damage. So it relieves the joint pain, swelling, redness, and fatigue that come with RA. Methotrexate comes in two forms for RA—an oral pill and a subcutaneous shot. Most people start out taking the pill form, but they may switch to subcutaneous methotrexate if the pills don’t work as well as they once did. Taking methotrexate subcutaneously helps get more of the drug into a person’s system. You may want to ask your doctor about the different dosing options and which one is right for you. Methotrexate has a long history of safety and is considered one of the safest treatments for RA. That doesn’t mean it doesn’t have any side effects, however. Gastrointestinal symptoms (stomach upset and vomiting) can occur with oral methotrexate. Why is methotrexate a cornerstone treatment for rheumatoid arthritis? What are some of the most common questions about methotrexate? How is subcutaneous methotrexate different from methotrexate pills?Does methotrexate work better in a pill or in an auto-injector pen?Are methotrexate auto-injector pens more expensive than methotrexate pills or solution? Methotrexate was actually developed in the 1940s as a cancer treatment, but years later it showed promise as an RA treatment. Today, it’s the foundational therapy in RA, and it’s often the first drug patients are prescribed after they are diagnosed. As many as 90% of all RA patients will take methotrexate at some point. Interestingly enough, it is still used to treat many forms of cancer, but at much higher doses than what is prescribed for RA. The combination of effectiveness and safety profile makes methotrexate a therapy many patients can stay on for years. for your next doctor visit. Unfortunately, there is no cure for rheumatoid arthritis (RA). 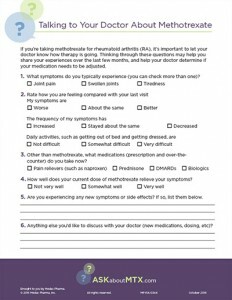 Methotrexate helps relieve many of the symptoms of RA, but it won’t cure the disease. How long will I take methotrexate? You can take methotrexate as long as it’s effective and helps improve your symptoms. Your doctor may prescribe other medications along with methotrexate as your disease progresses. Is methotrexate the medicine I see in TV commercials? Probably not. Chances are the medications you have seen advertised on TV are called biologic therapies, which are commonly prescribed by rheumatologists and are often used concurrently with methotrexate. Does methotrexate work as well as those newer medicines? Although many biologic therapies are now available, methotrexate is still considered the cornerstone of RA treatment and is usually the first medicine prescribed. In fact, biologic therapies have been found to work better and longer when combined with methotrexate. Does methotrexate therapy require any lab tests? Some RA drugs, including methotrexate, can cause organ damage. That’s why you’ll have to undergo routine lab tests so your doctor can monitor your liver and kidney functions. These tests are performed as often as your doctor thinks best, usually every several weeks. Can I drink alcohol while taking methotrexate? Methotrexate has been associated with liver damage, so many doctors recommend abstaining from alcohol while you are on therapy. Make sure you ask your doctor before mixing methotrexate and alcohol. 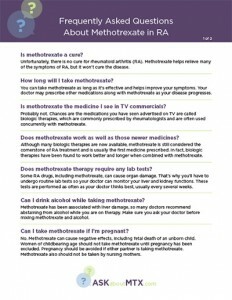 Can I take methotrexate if I’m pregnant? No. Methotrexate can cause negative effects, including fetal death of an unborn child. Women of childbearing age should not take methotrexate until pregnancy has been excluded. Pregnancy should be avoided if either partner is taking methotrexate. Methotrexate also should not be taken by nursing mothers. Why did my dose change? Probably because your current dose wasn’t controlling your symptoms as well as it once was. Your doctor most likely increased your dose to better control your symptoms. Most patients see symptom relief in about 3 to 6 weeks, although it can take up to 12 weeks for methotrexate to reach its full effect. That’s why it’s important to give the therapy enough time to work for you. It’s true that some patients experience nausea and vomiting while taking methotrexate pills. Studies have shown that subcutaneous methotrexate (an injection under the skin) may be easier on the stomach than pills. Do I have to take it on the same day every week? Yes, you should take your methotrexate on the same day each week. Can I take ibuprofen with my methotrexate? Yes, you can take ibuprofen with methotrexate. Why do some people take folic acid with methotrexate? Methotrexate, originally created as a cancer drug, stops cells from multiplying by blocking a form of vitamin B called folic acid. Depleting your body of folic acid can have consequences, including side effects such as nausea, vomiting, hair loss, and mouth ulcers. The good news is that taking a folic acid supplement (a synthetic form of folate) can help reduce these side effects. One study found that folic acid reduced stomach upset and mouth sores by 79%. Does methotrexate cause weight gain? There’s no evidence that methotrexate causes weight gain. Methotrexate can be given many ways, depending on your condition. For conditions such as rheumatoid arthritis, psoriasis, or active polyarticular juvenile idiopathic arthritis (pJIA), patients can give themselves methotrexate orally in pills or subcutaneously by injecting methotrexate solution. When methotrexate is injected subcutaneously, it is given through a syringe or an auto-injector pen. There are different dosages for methotrexate pills and methotrexate solution administered through syringes or auto-injector pens. If you need to take methotrexate, your doctor will decide what dosage is right for you. When methotrexate is taken as an injection, the body absorbs it in a different way than when it is taken orally. Studies have shown that patients who take subcutaneous methotrexate may have a better response to treatment and find it easier on their stomach than methotrexate taken by mouth. Will my insurance cover subcutaneous methotrexate auto-injector pens? Does the auto-injector pen hurt when you use it?How hard is it to use an auto-injector pen?What kind of co-pay will I have with subcutaneous methotrexate auto-injector pens? Well, that can depend on many things! For one thing, it can depend on whether you prefer taking your medications through your mouth or by another route. Some people have a hard time swallowing their oral medications. Other people may not like being injected with a needle. But in terms of how well methotrexate works in treating a condition, taking a drug orally may affect how your body absorbs it. Drugs that are taken by mouth have to pass through the stomach and small intestine to be absorbed. Drugs that are injected do not have to go through this system—so more medication may be absorbed into the body to do its job. Clinical studies have shown that patients given subcutaneous methotrexate through an auto-injector pen were able to absorb more of the drug—and experienced fewer gastrointestinal side effects—than patients given methotrexate tablets. Are methotrexate auto-injector pens more expensive than methotrexate pills or solution? Generic methotrexate is available in a pill form and in a liquid solution, which comes in a vial and is injected by syringe. At this time, there are no generic forms of subcutaneous methotrexate auto-injector pens. However, the companies that make or market methotrexate pills, solution, and auto-injector pens may offer co-pay help or coupons that help eligible patients afford their medications. If you’ve been prescribed methotrexate, your doctor’s office may be able to help you learn about these kinds of patient and financial assistance programs. As with other medications and treatments, this will depend on your insurance carrier and coverage. It’s best to talk to someone at your insurance company to find out—you may find a contact number on the back of your insurance card. Your doctor’s office may be able to contact your insurance carrier to determine your benefits as well. Also, if your doctor prescribes treatment with a subcutaneous methotrexate auto-injector pen, the company that markets your pen may offer a patient support program to help you afford your prescription. Visit the product website to see if such a program is available. What kind of co-pay will I have with subcutaneous methotrexate auto-injector pens? Does methotrexate work better in a pill or in an auto-injector pen?Does it make a difference if you take methotrexate in a pill or in an auto-injector pen?How hard is it to use an auto-injector pen? Everyone is different, so the same medication will have different effects on individual people. The same goes for methotrexate. That being said, a medication given through the mouth is absorbed through the stomach and small intestine. When that same medication is given in a different way—say, under the skin—it does not have to go through the stomach and small intestine to be absorbed. This means more of the medication is available to work in the body. The different ways the drug can be administered may cause a different response in patients. Methotrexate given subcutaneously through an auto-injector pen may be more effective than methotrexate given through a pill—and it may also cause fewer side effects on the stomach. Subcutaneous methotrexate can be given by injection from a vial and syringe or prefilled syringe or through an auto-injector pen. Auto-injector pens can work in different ways, but they are designed to make it easy for people to inject themselves with a medication. Sign up for news updates about subcutaneous methotrexate auto-injector pens. Keep getting answers to your questions. This may depend on your individual insurance plan and carrier. And—aside from insurance—companies offer co-pay assistance programs to help with the cost. If your doctor prescribes a treatment with subcutaneous methotrexate auto-injector pen, be sure to check out what co-pay programs are available on the pen product website. What are some of the myths about methotrexate? The myth: There’s no difference between oral and subcutaneous methotrexate. The reality: There are a few differences between these two forms of methotrexate, actually. The subcutaneous form delivers more methotrexate into the blood. That is why studies have shown it is more effective than the oral form when it comes to controlling rheumatoid arthritis (RA) symptoms. And for many people, subcutaneous methotrexate is easier on the stomach than the pill form. The myth: Methotrexate takes too long to work. The reality: Most patients begin to feel symptom relief between 3 and 6 weeks, and studies have shown that patients had significant symptom improvement within 3 months of treatment. Patients may continue to improve for up to 1 year, with relief sustained even longer. The myth: Methotrexate is chemotherapy and poisons the body. The reality: It’s true that methotrexate has been used effectively to treat many different cancers. However, the doses used in cancer treatment are much higher than those used in RA. For example, the dose used in RA is typically no more than 25 mg/week, whereas doses for cancer can range from 15 mg/day up to 175 mg/week. The myth: Methotrexate doesn’t work as well as biologic therapy. The reality: Actually, multiple studies have shown that in approximately 30% of patients with RA, methotrexate taken alone was effective for controlling symptoms. The myth: Methotrexate doesn’t slow or stop the progression of RA. The reality: Several studies that followed patients for at least 3 years have shown that methotrexate slowed or stopped disease progression as well as biologic therapy did in 60% to 70% of patients. How is subcutaneous methotrexate different from methotrexate pills?Does methotrexate work better in a pill or in an auto-injector pen?How does using a syringe and vial compare to using an auto-injector pen?